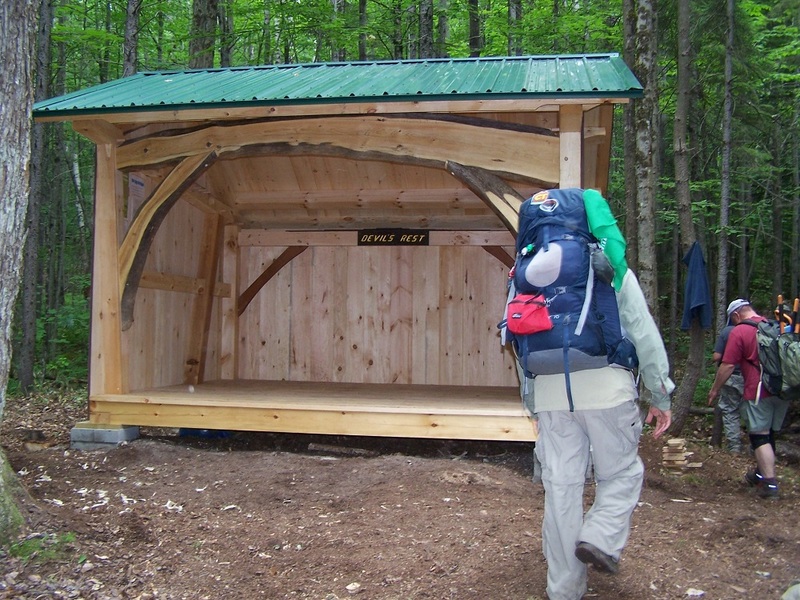 Devil’s Rest is a three-sided post-and-beam shelter designed and milled by Garland Mill Timberframes of Lancaster, New Hampshire. Garland Mill operates a historic water-powered sawmill and has been a long-time supporter of The Cohos Trail Association (TCTA). 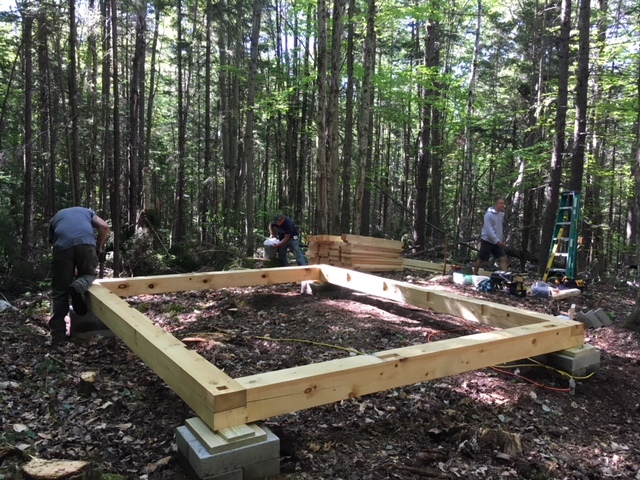 This is the second structure they have built for us; the first is the Old Hermit Shelter, located just off the West side trail in Nash Stream Forest, Stark, NH. Financial support was generously provided in large part by the Neil and Louise Tillotson Fund. TCTA board members and officers have been planning the Devil’s Rest project for over six years. After several attempts to locate the shelter, Devil’s Rest found its home in the Kauffmann Forest. Kauffmann is conservation land managed by The Society for the Protection of NH Forests (SPNHF); the forest abuts beautiful and pristine Christine Lake in Stark. 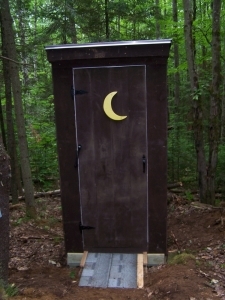 The lean-to sits in a quiet section of the woods, a short ½-mile hike off the Cohos Trail. 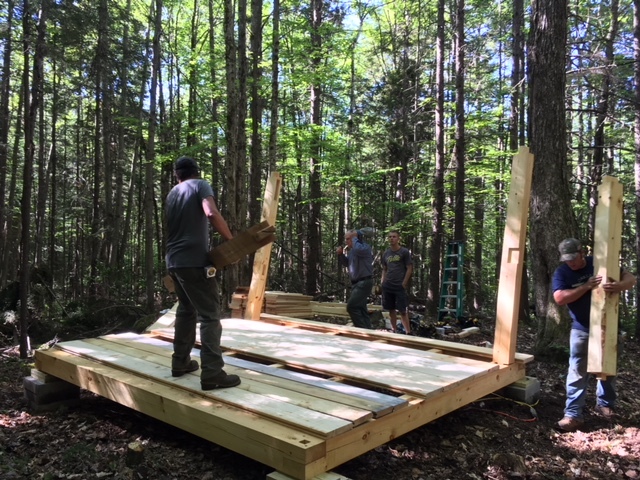 Initially planning to construct the shelter in the Fall of 2017, we were delayed by the now-infamous October 2017 storm that wreaked so much damage throughout New Hampshire’s forests. A 2018 spring weekend was settled upon, June 23-24. 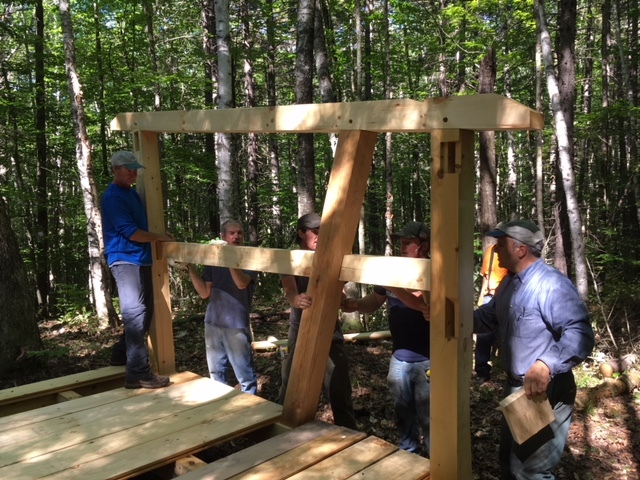 With the help of Garland Mill and 30+ volunteers, the shelter was assembled, painted, and roofed over the course of two days. Another group of volunteers helped assemble a classic TCTA composting latrine under the guidance of Jack Pepau of Stark who designed it. 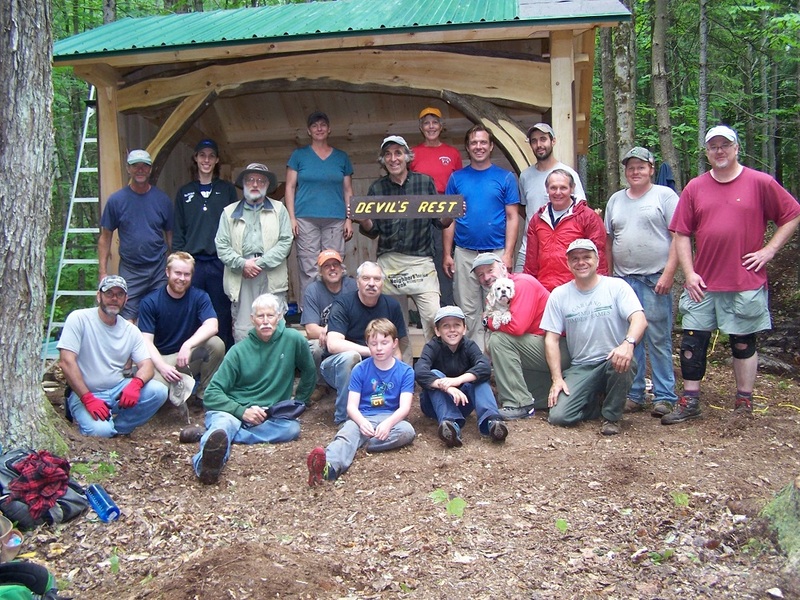 Over 400 hours of volunteer labor were contributed to the creation of this fine resting place in the North Woods of New Hampshire. Garland Mill Timberframes also generously donated timbers and roofing planks. Metal roof material was donated by Pride Roofing of Raymond, NH. Devil’s Rest is the fifth shelter built along the Cohos Trail. Other shelters include Baldhead, Panorama, Old Hermit, and Tillotson Hut, each providing a unique and scenic respite for hikers. TCTA relies on volunteer labor and the generous support of partners and donors to keep the trail moving forward. 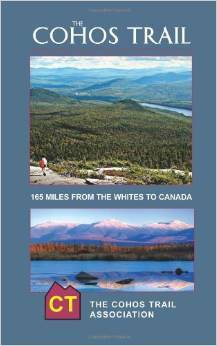 Thanks go out to them and the landowners who allow access to property along the 170-mile thru-hiking trail. 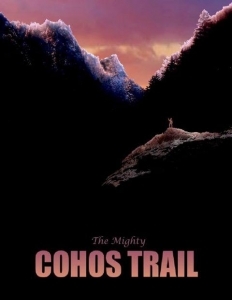 Hike the mighty Cohos Trail!